Proudly bearing the greatest name in naval history, the battleship H.M.S. 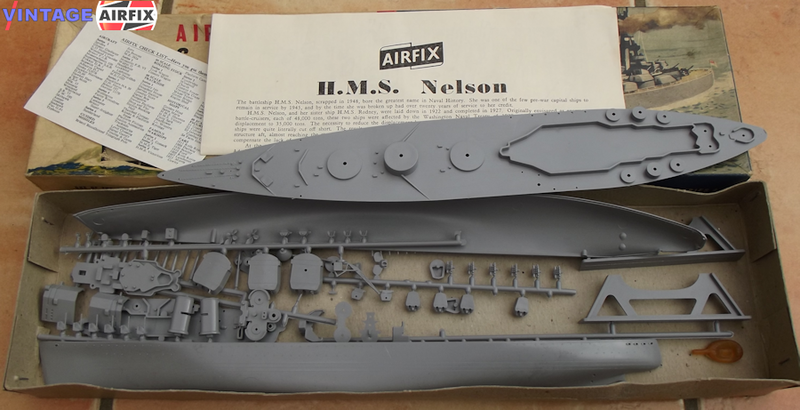 Nelson is accurately reproduced by Airfix in this 134 part kit. The 14 inch deck of this fine model is packed with authentic detail. The nine 16 inch guns, twelve 6 inch guns, all on rotating turrets, the Anti-Aircraft Guns, Whalers, Cutters and Launchers, even the carefully moulded anchor chains on the forward deck, they are all there plus a lot more to make this famous battleship a worthy addition to any collection. The H.M.S. "Nelson" was completed in 1927 and was one of the few pre-war Capital ships to remain in service until 1945.